appetizer that debuted at the wedding rehearsal/cocktail/New Year’s Eve party a few years ago. I knew we would feature different proteins to appeal to a broad palate. Unfortunately, chicken often becomes very dry when served and left warm over an extended period of time. 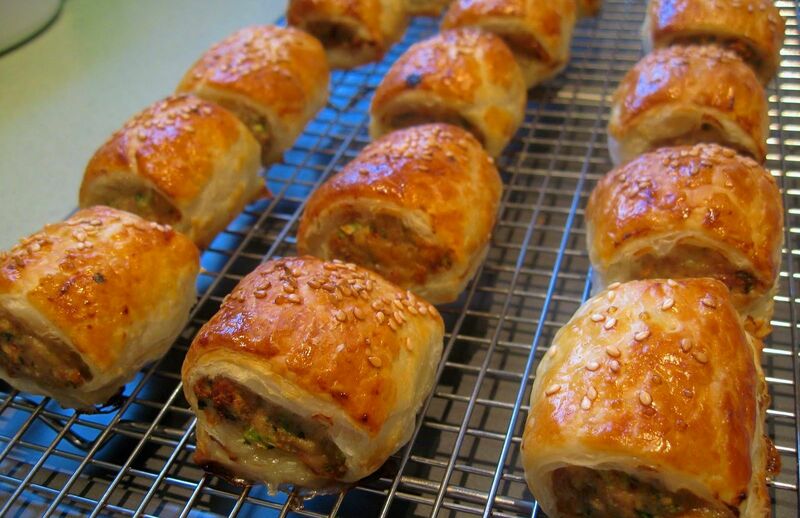 It took a bit, but eventually I decided on these chicken sausage rolls which stayed successfully moist and tasty through the event. They were simple to make, had a hint of Asian flavours, and nary a roll was left at midnight! The sesame-sprinkled crispy puffed pastry shell gave way to a tender and moist chicken filling flecked with grated carrots and spring onions. I definitely need to bring these rolls back into my entertaining rotation. Preheat oven to 400F. Lightly grease two baking trays. Cut pastry sheets in half and lightly brush edges with some beaten egg. In a large bowl, mix half of the remaining egg with the remaining ingredients, except for the sesame seeds. Divide into six portions. Pipe or spoon the filling down the centre of each piece of pastry and brush edges with beaten egg. Fold the pastry over the filling, overlapping the edges and placing the join underneath. Brush rolls with more egg, sprinkle with sesame seeds, then cut each into 6 short pieces. Cut two small slashes atop each roll, place on baking trays and bake for 15 minutes. Reduce the heat to 350F and bake another 15 minutes or until puffed and golden.